Our Common Wealth: The Hidden Economy that Makes Everything Work. Our Common Wealth is an absolute joy to read. Jonathan Rowe insightfully articulates feelings held deep within many of us that an essential part of our human experience is being co-opted and stolen. Rowe discusses why such feelings exist as well as actions that can regain these pieces of our humanity. Rowe’s writing focuses on the ‘commons.’ The commons refers to resources that are accessible to all members of society. Thus they are held in common and are not privately owned. Such resources include air, water, land, software, airwaves, and more. This book is not a history lesson about the negative consequences of privatizing common resources nor does it urge returning private property to common ownership. 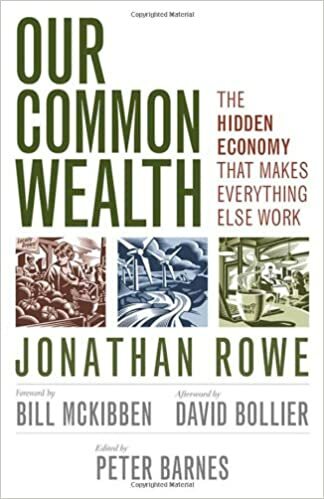 Instead, Rowe advocates for this hidden economy that quietly supports society by detailing its function, providing current, relatable examples, and inspiring action. In a very concise and understandable way, Rowe shows the importance of the commons and the consequences of its dismantling. “Today the privatization of common wealth has reached historic heights, and it’s not coincidental that, as these taking has accelerated, so has the gap between the rich and everyone else.” (pg. 69). The idea of the commons fits well within the philosophy of sustainable development. It relates to social, environmental, and economic sustainability as well as inherent intergenerational considerations. The commons creates social space and the opportunity for people to interact and respect one another. It promotes environmental stewardship, as protecting the integrity of air, water, and land ensures continuing benefits for its stewards. The commons also provides a setting where long-term economic planning is paramount to managing for quarterly performance. Finally, anything held in common, such as grazing land or clean air, can be held and maintained in common from generation to generation. In a posthumous publishing after Rowe’s unexpected death in 2011, a close friend of Rowe, Peter Barnes, entrepreneur, editor, and author (Who Owns the Sky, Capitalism 3.0: A Guide to Reclaiming the Commons), was able to capture Rowe’s thoughts, spirit, and style in finishing the book Rowe had begun. Barnes notes that the book was pieced together from Rowe’s writings between 1993 and 2011. Our Common Wealth is accessible to all. Practitioners, policy makers, students, and everyday citizens will connect to ideas presented within a number of short chapters discussing individual ideas and using the thread of the commons to weave them all together.